FILE - This combination of photos show North Korean leader Kim Jong Un on April 15, 2017, in Pyongyang, North Korea, left, and U.S. President Donald Trump in Washington on April 29, 2017. As the U.S. and its allies welcome the latest U.N. sanctions against North Korea as a good, incremental step to increase pressure on the Kim Jong Un regime, a question looms: Will this cause economic pressure strong enough to change Pyongyang's behavior? Many experts say they aren't so sure. 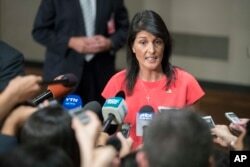 In the latest push to curb North Korea's rapidly advancing nuclear and missile programs, the United Nations Security Council passed sanctions Saturday that Nikki Haley, the U.S. ambassador to the U.N., said were “the most stringent” actions taken against any country in a generation. Anthony Ruggiero, who worked on sanctions at the Treasury Department and is now with the Foundation for the Defense of Democracies, told VOA Korean that much depends on how effectively China enforces the sanctions, particularly those aimed at “reining in the activities of Chinese companies who have collaborated with North Korea and North Korean brokers in China.” According to South Korean statistics, China accounts for an average of 90 percent of total trade with North Korea. “Over the last 11 years, we have not seen the level of sanctions necessary, and we know that non-North Koreans are facilitating North Korea's sanctions evasion,” said Ruggiero, who regretted that U.N. sanctions are focusing primarily on the North Koreans. The resolution added nine people to the U.N. blacklist. All of them are now subject to a global asset freeze and travel ban. All are North Koreans, four in Russia and five in China, who are either officials or representatives of companies and banks, said Ruggiero. U.S. Ambassador to the United Nations Nikki Haley speaks to reporters after a Security Council vote on a new sanctions resolution that would increase economic pressure on North Korea to return to negotiations on its missile program, Aug. 5, 2017. 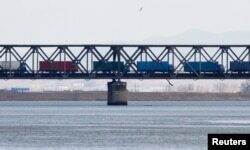 The latest resolution — the seventh since the North's first nuclear weapons test in 2006 — imposes a total ban on North Korea's primary exports — coal, iron, lead and seafood — aiming to slash the country's roughly $3 billion export revenue by a third. It aims to cut other sources of hard currency by prohibiting countries from expanding the current numbers of North Korean overseas laborers they employ, and bans new joint ventures with North Korea and any new investment in current joint ventures. “Each U.N. resolution is better than its predecessor and each one is the strongest in history against North Korea,” said Bruce Klingner of the Heritage Foundation. Robert Manning, an East Asia expert at the Atlantic Council, said while the Trump administration deserves some credit both for the substance of the tougher economic sanctions and for getting Beijing and Moscow on board, he believes there are several weaknesses to the new resolution. There are currently 123,000 North Korean workers overseas, with 30,000 in Russia and between 70,000-80,000 in China, according to the Korea Institute for National Unification. The U.S. State Department estimates they earn more than $1 billion annually for the Kim regime. A ban or even a very minimal restriction on North Korea's import of oil should have been included in the resolution, as that could be damaging to Pyongyang, said Ruggiero. China supplies the regime with roughly 500,000 tons of crude oil annually, according to South Korean data. China also exports over 200,000 tons of oil products, according to U.N. data reported by Reuters. Fishman, who is now with the Atlantic Council, said the cooperation of China and Russia in implementing the sanctions will be the test of whether the U.N. Security Council is the correct venue for pressuring Pyongyang. The benefit of those sanctions, Fishman said, is that it would then be up to the U.S. to go after Chinese firms that help the Kim regime circumvent sanctions on its military programs and sever them from the dollar-based global financial system.